english name "Elegant Slender Caesar"
The following description is based on Beeli (1935). cap The cap of Amanita elegans is 40 - 60 mm wide, plano-convex, fuligineous, approaching black in the center, with a long striate margin. No volval remnant is present. The flesh is thin. gills Gills are free, white, pointed at both ends, 3 mm broad. stem Its stem is 60 - 90 × 4 - 6 mm, white, fibrillose, stuffed, cylindric, and detaches easily from the cap. 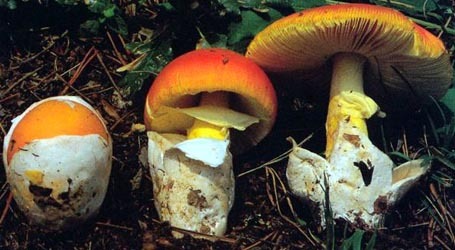 The stem has a ring that is placed near the middle, thin, very fragile, and skirt-like. The volva is saccate, membranous, white or dark brown. The flesh is white. odor/taste The taste is acrid. spores The spores measure 7.5 - 9 × 6.5 - 8 µm and are subglobose to broadly ellipsoid. Clamps are said to be absent at bases of basidia by Pegler and Shah-Sm. (1997). Beeli measured spores as 6.5 - 8 µm in diameter and inamyloid. Gilbert (1940) presents six drawings of spores, however only two are in side view. These measure (6.7-) 7.6 - 8.1 (-9.1) × 6.1 - 7.1 (-8.6) μm and are subglobose to broadly ellipsoid. discussion The present species was originally described from the Belgium Congo in dry forests. Pegler and Shah-Smith report this species form Zambia and Malawi in association with open Brachystegia woodland. Their description differs from that of Beeli only in adding yellowish-brown or yellowish-pink to the list of colors observed on the cap. Further examination of well-annotated material would be valuable in determining variation in this species. The spore drawings in Beeli (1935) and Gilbert (1940) confirm that the spores are not truly globose. They are subglobose to broadly ellipsoid. The cap in Madame Goossens' drawing is considerably more gray than the original description might lead you to believe and while the margin is dark while young, in the oldest specimen depicted the margin of the cap is pale, probably because the skin of the cap has been stretched or torn in the area of the expanded striations to show the white flesh and gills. There is a confusing pink tint in some of the 1935 reproduction of the Goossens watercolors which may have led Pegler and Shah-Sm. (1997) to believe that the cap could have a pink tint. The paintings of Madame Goossens show that the volva encloses 20 - 35% of the stem. Madame Goossens' watercolor shows a species with a totally elongating stem inserting in an extraordinarily thick, saccate volva. Gilbert interpreted this as a bulb similar to that at the base of the stem of A. virosa (Fr.) Bertillon in DeChambre; however there is no question that this species is not in section Phalloideae because its spores are inamyloid. author Beeli. 1931. Bull. Soc. Roy. Bot. Belgique 63: 105, pl. 8 (fig. 5). ≡Ariella elegans (Beeli) E.-J. Gilbert. 1940. Iconogr. Mycol. (Milan) 27, suppl. (1): 70; tab. 10 (fig. 5). The following material is derived from the protolog of the present taxon, (Beeli 1935), and (Gilbert 1940 & 1941). pileus from protolog: 40 - 60 mm wide, fuligineous, darker over disc, plano-convex; context thin, white, fleshy; margin long striate (0.5+R per figure); universal veil absent (per figure). lamellae from protolog: free. density not described, white, 3 mm broad; lamellulae not described. stipe Stipe: from protolog: 80 - 90 × 4 - 6 mm, white, cylindric, fibrous, glabrous, cylindric, totally elongating (per figure), easily detached from pileus; context solid, white, firm; partial veil submedian, very thin, ephemeral; universal veil saccate, membranous, fleshy (per figure), enclosing lowest one-fifth to one-third of stipe (per figure). odor/taste from protolog: Odor not described. Taste acrid. pileipellis from Beeli (1935): filamentous hyphae hyaline, broad, with allantoid segments. ecology from protolog: Scattered. On soil in dry forest. material examined from protolog: CONGO, DEMOCRATIC REPUBLIC OF: PROV. EQUATEUR—Territoire Lisala - Binga [2°23'41" N/ 20°25'25" E, 361 m], x.1929 Goossens 895 (holotype, BR). select a collection to review/add spore measurements..#703930. Goossens, #895, CONGO, DEMOCRATIC REPUBLIC OF, PROV. EQUATEUR, Territoi..#784565. Goossens, #895, CONGO, DEMOCRATIC REPUBLIC OF, PROV. EQUATEUR, Territoi..